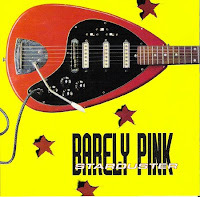 Once upon a time, a grand indie power pop label (Big Deal Records) released a stupendous album (Number One Fan) by one Barely Pink in 1997. I'll try to avoid anymore superlatives and parentheses from here on in. Evoking the best of likeminded acts, including but not limited to Velvet Crush, Teenage Fanclub, and Big Star, Barely Pink also injected a mild southern vibe into an already winsome recipe. Number One Fan, (also known written as a single word Numbeonefan) linear and straightforward as it was, helped cultivate a small following for BP, but as luck would have it, after Big Deal folded the band's subsequent releases did not enjoy anything resembling wide-scale distribution. Admittedly, this Orange State quartet fell off my radar too, despite two follow-up albums, Elli's Suitcase and Last Day of Summer that never made it into my CD player. The Starduster ep was a precursor to ...Fan, featuring a smattering of tracks that made it into the album and one or two that didn't. It also boasts three unlisted cuts, including a Big Star remake. Great EP that shows tons of promise for this band. If you can track down their later albums, I think you'll be pleasantly surprised. Not as good as the EP or Numberonefan, but pretty good power pop all the same. Hiya. possible to reup when you get a chance? Thank you!